Thirty Supernovas per Second in the Observable Universe! Is the Red Giant Betelgeuse Next? Betelgeuse, one of the brightest stars in the sky, could burst into its supernova phase and become as bright as a full moon — and last for as long as a year. The massive star is visible in the winter sky over most of the world as a bright, reddish star, could explode as a supernova anytime within the next 100,000 years. Most astronomers today believe that one of the plausible reasons we have yet to detect intelligent life in the universe is due to the deadly effects of local supernova explosions that wipe out all life in a given region of a galaxy. While there is, on average, only one supernova per galaxy per century, there is something on the order of 100 billion galaxies in the observable Universe. Taking 10 billion years for the age of the Universe (it's actually 13.7 billion, but stars didn't form for the first few hundred million), Dr. Richard Mushotzky of the NASA Goddard Space Flight Center, derived a figure of 1 billion supernovae per year, or 30 supernovae per second in the observable Universe! The red giant Betelgeuse, once so large it would reach out to Jupiter's orbit if placed in our own solar system, has shrunk by 15 percent over the past decade in a half, although it's just as bright as it's ever been. "To see this change is very striking," said retired Berkeley physics professor Charles Townes, who won the 1964 Nobel Prize for inventing the laser. "We will be watching it carefully over the next few years to see if it will keep contracting or will go back up in size." Betelgeuse, whose name derives from Arabic, is easily visible in the constellation Orion. It gave Michael Keaton's character his name in the movie "Beetlejuice" and was the home system of Galactic President Zaphod Beeblebrox in "The Hitchhiker's Guide to the Galaxy." Red giant stars are thought to have short, complicated and violent lifespans. Lasting at most a few million years, they quickly burn out their hydrogen fuel and then switch to helium, carbon and other elements in a series of partial collapses, refuelings and restarts. Betelgeuse, which is thought to be reaching the end of its lifespan, may be experiencing one of those collapses as it switches from one element to another as nuclear-fusion fuel. "We do not know why the star is shrinking," said Townes' Berkeley colleague Edward Wishnow. "Considering all that we know about galaxies and the distant Universe, there are still lots of things we don't know about stars, including what happens as red giants near the ends of their lives." If Betelgeuse goes nova, it could offer Earth's astronomers an up close look at how supernovae evolve and the physics that governs how they work. The problem is that it is not clear when that will happen. While stories have been circulating that the star could explode in 2012, the odds of that are actually quite small. Betelgeuse may explode tomorrow night, or it may not go nova until the year 100,000 A.D. It's impossible to know. 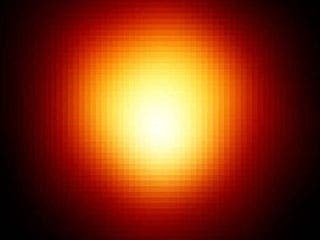 Betelgeuse is beyond the death beam distance — somewhere within 30 light years range — where it could do ultimate damage to Earth. The explosion won't do the Earth any harm, as a star has to be relatively close — on the order of 25 light years — to do that. Betelgeuse is about 600 light years distant. Betelgeuse, one of the most luminous stars known and ten times the size of the Sun, is thought to be only 10 million years old. The more massive a star is the shorter its lifespan, which is why astronomers think it has an outside chance of exploding relatively soon. Late in 2009, astronomers witnessed the largest explosion ever recorded: a super giant star two hundred times bigger than the sun utterly obliterated by runaway thermonuclear reactions triggered by gamma ray-driven antimatter production. The resulting blast was visible for months because it unleashed a cloud of radioactive material over fifty times the size of our own star, giving off a nuclear fission glow visible from galaxies away. The super-supernova SN2007bi is an example of a "pair-instability" breakdown, and that's like calling an atomic bomb a "plutonium-pressing" device. At sizes of around four megayottagrams (that's thirty-two zeros) giant stars are supported against gravitational collapse by gamma ray pressure. The hotter the core, the higher the energy of these gamma rays — but if they get too energetic, these gamma rays can begin pair production: creating an electron-positron matter-antimatter pair out of pure energy as they pass an atom. Yes, this does mean that the entire stellar core acts as a gigantic particle accelerator. The antimatter annihilates with its opposite, as antimatter is wont to do, but the problem is that the speed of antimatter explosion — which is pretty damn fast — is still a critical delay in the gamma-pressure holding up the star. The outer layers sag in, compressing the core more, raising the temperature, making more energetic gamma rays even more likely to make antimatter, and suddenly the whole star is a runaway nuclear reactor beyond the scale of the imagination. The entire thermonuclear core detonates at once, an atomic warhead that's not just bigger than the Sun — it's bigger than the Sun plus the mass of another ten close-by stars. The entire star explodes. No neutron star, no black hole, nothing left behind but an expanding cloud of newly radioactive material and empty space where once was the most massive item you can actually have without ripping space. The explosion alone triggers alchemy on a suprasolar scale, converting stars' worth of matter into new radioactive elements. And we saw this. This really happened. Someday, somewhere, another massive explosion will occur and no one will be left to tweet it. Certain rare stars –real killers, type 11 stars — are core-collapse hypernova that generate deadly gamma ray bursts (GRBs). 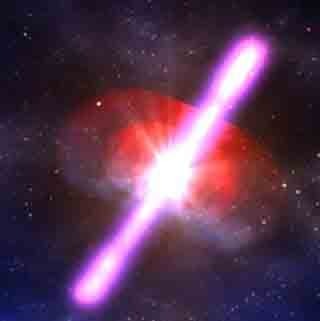 These long burst objects release 1000 times the non-neutrino energy release of an ordinary "core-collapse" supernova. Concrete proof of the core-collapse GRB model came in 2003. It was made possible in part to a fortuitously "nearby" burst whose location was distributed to astronomers by the Gamma-ray Burst Coordinates Network (GCN). On March 29, 2003, a burst went off close enough that the follow-up observations were decisive in solving the gamma-ray burst mystery. The optical spectrum of the afterglow was nearly identical to that of supernova SN1998bw. In addition, observations from x-ray satellites showed the same characteristic signature of "shocked" and "heated" oxygen that's also present in supernovae. Thus, astronomers were able to determine the "afterglow" light of a relatively close gamma-ray burst (located "just" 2 billion light years away) resembled a supernova. It isn't known if every hypernova is associated with a GRB. However, astronomers estimate only about one out of 100,000 supernovae produce a hypernova. This works out to about one gamma-ray burst per day, which is in fact what is observed. What is almost certain is that the core of the star involved in a given hypernova is massive enough to collapse into a black hole (rather than a neutron star). So every GRB detected is also the "birth cry" of a new black hole. Scientists agree that new observations of T Pyxidis in the constellation Pyxis (the compass) using the International Ultraviolet Explorer satellite, indicate the white dwarf is part of a close binary system with a sun, and the pair are 3,260 light-years from Earth and much closer than the previous estimate of 6,000 light-years. The white dwarf in the T Pyxidis system is a recurrent nova, which means it undergoes nova (thermonuclear) eruptions around every 20 years. The most recent known events were in 1967, 1944, 1920, 1902, and 1890. These explosions are nova rather than supernova events, and do not destroy the star, and have no effect on Earth. The astronomers do not know why the there has been a longer than usual interval since the last nova eruption. Astronomers believe the nova explosions are the result of an increase of mass as the dwarf siphons off hydrogen-rich gases from its stellar companion. When the mass reaches a certain limit a nova is triggered. It is unknown whether there is a net gain or loss of mass during the siphoning/explosion cycle, but if the mass does build up the so-called Chandrasekhar Limit could be reached, and the dwarf would then become a Type 1a supernova. In this event the dwarf would collapse and detonate a massive explosion resulting in its total destruction. This type of supernova releases 10 million times the energy of a nova. Observations of the white dwarf during the nova eruptions suggest its mass is increasing, and pictures from the Hubble telescope of shells of material expelled during the previous explosions support the view. Models estimate the white dwarf's mass could reach the Chandrasekhar Limit in around 10 million years or less. According to the scientists the supernova would result in gamma radiation with an energy equivalent to 1,000 solar flares simultaneously — enough to threaten Earth by production of nitrous oxides that would damage and perhaps destroy the ozone layer. The supernova would be as bright as all the other stars in the Milky Way put together. One of the astronomers, Dr. Edward Sion, from Villanova University in Pennsylvania, said the supernova could occur "soon" on the timescales familiar to astronomers and geologists, but this is a long time in the future, in human terms. Astronomers think supernova explosions closer than 100 light years from Earth would be catastrophic, but the effects of events further away are unclear and would depend on how powerful the supernova is. The research team postulate it could be close enough and powerful enough to damage Earth, possibly severely, although other researchers, such as Professor Fillipenko of the Berkeley Astronomy Department, disagree with the calculations and believe the supernova, if it occurred, would be unlikely to damage the planet.